Labor Day? What does it mean anymore? | Russellink. Labor Day? What does it mean anymore? – Russellink. Home » Lost Towns of North Georgia » Labor Day? What does it mean anymore? Labor Day? What does it mean anymore? Norman Hall told the company he was 12, but he was probably 8 years old. End of summer? Cook-outs? Sales? Politics? Maybe Labor Day is about all of these things but at the same time none of these things. Last week a student asked me the meaning of Labor Day. I realized that we have lost the original meaning of this day off. My father, a hard-working man, used to say that the laborers are the only ones to have to work on Labor Day. I guess if you worked today, you understand. Watch this mini-history lesson from History channel: http://www.history.com/topics/holidays/labor-day. It explains the origins of Labor Day with cinematic skill. What is not mentioned in this History clip is the North Georgia connection. Lindale, Georgia – a once bustling town and productive member of Georgia’s industrial society – now crumbles into the past. Today, Lindale residents proudly embrace its and for good reason. Lindale played an important role in child labor laws that would end abusive conditions for all American children. Norman walked with dread toward the stacks. Each step took him away from his mill home on Park Avenue in Lindale and away from school – his only way out of the mill. Each reluctant stride took a ten-year-old wrinkled boy to work. Work was the lint choked spinning floor of the Massachusetts Mills. On this bright April day in 1913, Norman noticed a commotion. Just outside of the mill fence, the other doffers were talking to a man out of place. The bespectacled man was taking pictures and notes. 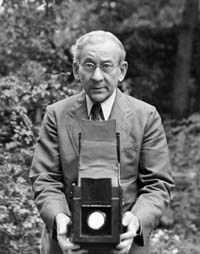 Lewis Hine was busy setting up his tripod camera when Norman walked by with eyes focused downward. Hine called out to him. “Can I take your picture?” Hine asked. Norman looked up. Hine knew he did not have the words to tell this boy’s story when he looked in his disheveled eyes. Hine would have to let his camera lens do its job. Lewis Hine photographed children in dangerous working conditions. These photographs influenced Washington Law makers to write Child Labor Law. Lindale played a role in that change. Norman was dirty before he got to work and the sun was hurting his eyes, so he squinted as Lewis Hine focused his camera. The explosion of the ancient camera froze Norman Hall in time – dirt and all. The dirt lines highlighted the lines on his face that belonged to a middle-aged man, not a ten-year-old boy. Hine asked Norman his name and age and Norman replied, “Norman Hall, and I’m 12.” Hine expected the standard lie and made a mental note to check the insurance papers. Hine could measure the height of a child by the buttons on his vest and determine their age. He also could talk his way into the mill office and the mill floor. Hine’s images would haunt the nation. In 1913, he worked with the National Child Labor Committee (NCLC) presenting the images to Congress. This led to solid legislation in 1938. The government began enforcing strict child labor laws. The loss of child labor was neither the end nor the beginning of Lindale, it was just part of the story. Lewis Hine made a difference. Today, Lindale appears to be lost in helpless restoration, but it is found in its history. 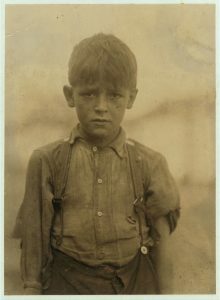 Lewis Hine and the images of the Lindale children – adds another layer of meaning to Labor day. The meaning of Labor Day is lost. Labor laws have made us forget the insignificant laborers who rose up and organized. History has overlooked the unknown man who came from the North to photograph children like Norman Hall. The idea of children working in dangerous mills today is incomprehensible, but it not for Hines and places like Lindale, we might remember what Labor Day is really all about. Read more about Lewis Hine in this informative article in the Huffington Post. Read more about Lindale and other Lost Towns of North Georgia. Available at Amazon.com. My father opened his pharmacy in Lindale, Ga in 1983 inside Millican’s Foodland. He had so many customers that would talk to him about the mill, their lives and the jobs that they had. I never knew the child labor issue that had gone on there. This was so very informative. Thank you for writing these very important parts of history that everyone should know about. That is so interesting. I can’t wait for you to read the Lindale chapter and the part about the lazy men hanging out at the grocery store.